I’ve never really talked about my garden on the blog….this is the kind of stuff that runs through my head when I should be asleep. And it’s the kind of thing that can torture me for days until I do something about it. So here I am…writing about my veggies and herbs. Probably not the most opportune time since it’s the middle of winter and not much is really growing right now. But I knew if I didn’t share this soon I would have endless nights of restless sleep. Growing up in a row home, on a small street, in Philadelphia we didn’t have much of a backyard; but the space we did have was well utilized. There was room for a grill, a small space to play and a patch of dirt for the tomatoes. Every summer without fail my family grew tomatoes. As I got older and things changed (I no longer played in the backyard) there was slightly more room for growing and plants like basil and peppers were added; but the tomatoes were always the priority. 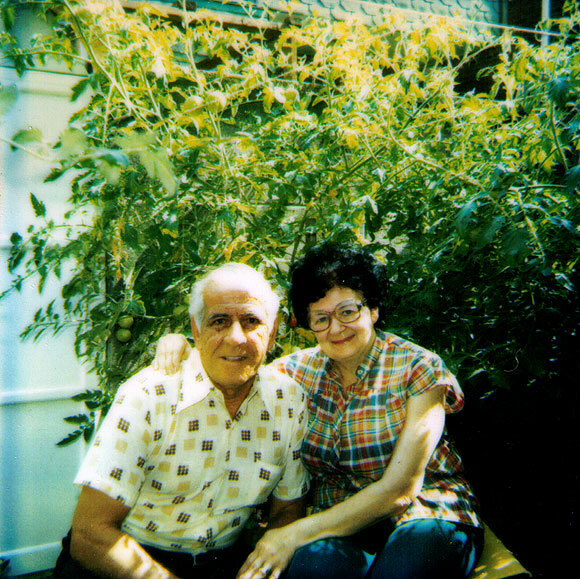 You can see the joy in my grandparents eyes as they sit in front of their tomato plants in the picture below. When I moved to Phoenix and found myself with quite a bit of backyard space I just knew I had to have a garden of my very own. Although, in the beginning, it was all my idea, I’ll admit that my husband has since become the primary gardener. But I do my fair share and don’t feel guilty taking pride in it. Since we’ve moved in our house, about 8 years ago, we’ve expanded the garden at least 3 times. Each time adding something new to our crop and always another tomato plant. What do we currently have planted? If I told you we have 6 varieties of tomatoes would you believe me? Well you should; because we do. We have cherry tomatoes and yellow pear on one side of the garden. Plum tomatoes we grew from seeds smuggled back from Italy on the other side. Two different varieties of Jersey tomatoes…official seeds right from Rutgers University. And a beefsteak from the local Home Depot. We also have 3 different varieties of peppers…two of which are extremely hot and were also smuggled back from Italy and a bunch of bell peppers. There’s spinach, asparagus (which I found out takes years to grow) garlic and artichokes attempting to push through. And tons of herbs: basil, thyme, mint, lemon balm, parsley, rosemary, bay leaf and oregano. Having a garden is lots of work; tending to the plants, fending off the critters and harvesting the veggies. You realize it's all worth it when you can put together dishes like the one below with your homegrown bounty. Heat olive oil in a medium pan. Add sausage saute until brown. Add garlic and cook until fragrant. Remove sausage and garlic from pan and keep warm. Add peppers to pan and cook till tender. In the meantime cook pasta in boiling water. Add asparagus stems to boiling water about 5 minutes before pasta is done. Or add with pasta if using homemade. 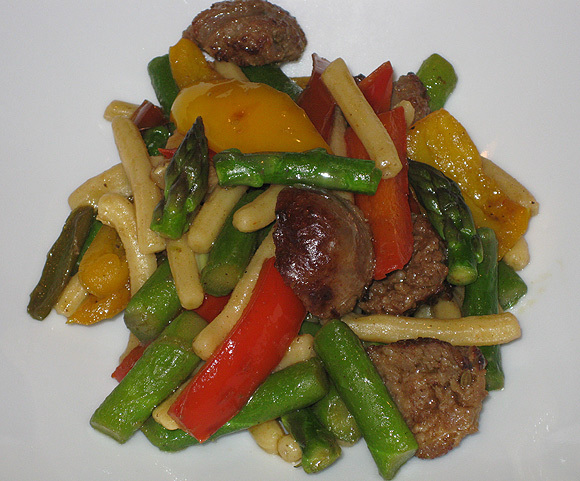 Transfer pasta and asparagus stems to pan with peppers. Add sausage and tender asparagus tips and saute until heated through. Finish with a drizzling of olive oil and parsley toss to coat. Serve with grated parmesan cheese. I'm submitting this to Presto Pasta Night being hosted by Ruth of Once Upon A Feast. Be sure to stop by her blog on Friday to check out all of this week's delicious pasta dishes. Just a reminder...There's still a few days left to enter to win a $75 gift card to NOVICA. See my previous post for details. I take my hat off to you! Even asparagus. All I can manage is soft fruit and string beans. Enjoy them! I tried tomatoes last year and they were doing really well - then suddenly they all had black marks on them and that was the end of my tomato growing! I will try again this year though. Love your pasta dish with sausage. You have got to show me & hubby your gardening tricks! Ours always fry in the heat :( Love all that you have going on here now- site looks great! It's a lovely story as I look out my window at tons of snow that will take a very long time to melt... gardens are definitely well hidden. Thanks for sharing a great recipe with Presto Pasta Nights. Oh my I am SO jealous of your garden! And I LOVE that you made a meal from its goods! Beautiful. All those tomatoes and peppers in your own yard? How glorious! I'm so happy you followed in your grandparents' footsteps. thanks for the post! I love to hear about other people's gardens. I'm looking for a new place to live and garden space is one of my dealbreakers - life just isn't much fun without one! I think it's great you wrote about your garden in the middle of the winter. We all need a little sunshine with this cold weather. Your pasta looks fabulous and I can only imagine how wonderful if tastes with home grown veggies. YUM! I love fresh vegetables! Your garden sounds amazing! I loved hearing about your garden! Ryan just started our own vegetable garden, and I can't wait until we can feast on the bounty of his labor. Thank you for sharing your greens with me. I hope you have a great weekend. I'm ready for some warmth! I love the picture of your grandparents! My grandfather always has a garden each year and it is only when I am eating tomatoes straight off the plants that I am sad to live in a townhouse cooperative and not be responsible for lawn maintenance. I am so jealous! Here in New Jersey I am fortunate to have a wonderful herb garden in the summer, but I am missing it so much during the cold snowy winter. Lovely post! Nothing makes me happier than cooking with vegetables and herbs I grew with my own two hands! It's immensely satisfying. Your pasta is delicious looking! I am so jealous of your tomato plants. I have to wait till August for a Jersey tomato. So nice to eat your own veggies from your garden. I can't wait!